Czechoslovakia (Československo; Ukrainian: Чехословаччина; Chekhoslovachchyna). The Czechoslovak Republic, later Czechoslovak Socialist Republic (ČSSR), was a federative republic in central Europe consisting of the Czech and Slovak republics. Its territory covered 127,875 sq km. In 1991 its population was 15,600,000. Prague was the capital of Czechoslovakia. Established in 1918, on 1 January 1993 the country was peacefully divided into the Czech Republic and Slovakia. History of Czechoslovak-Ukrainian relations. The Czechoslovak Republic established its independence on 28 October 1918 as a result of Austria-Hungary’s defeat in the First World War and the Czech and Slovak liberation movements. The main creators of the republic were Tomáš Garrigue Masaryk, Edvard Beneš, and Gen M. Štefánik. The Czech and Slovak troops, organized in Ukraine in 1917 from prisoners of war and the Czechoslovak National Council in Kyiv, were essential parts of the movement. Masaryk stayed in Kyiv for a time and maintained ties with the Ukrainian Central Rada. The Czechoslovak political leadership and army proclaimed a friendly neutrality in Ukraine's struggle for independence against the Russian Provisional Government and the Bolsheviks. When the Central Rada concluded the Peace Treaty of Brest-Litovsk, the Czechoslovak army retreated eastward into Russia and Siberia before the advancing German and Austrian armies. In 1919 the government of the Directory of the Ukrainian National Republic established unofficial diplomatic relations with the Czechoslovak Republic. Maksym Slavinsky was the Ukrainian representative in Prague. The government of the Western Ukrainian National Republic was also represented in Prague from the end of 1918 by a separate diplomatic mission, which was headed at first by Stepan Smal-Stotsky and then by Yevhen Levytsky. In 1921 the Czechoslovak Republic gave de facto recognition to the Ukrainian SSR, which was represented in Prague by Modest Levytsky. In 1921–2 a Czechoslovak trade and diplomatic mission was stationed in Kharkiv. The attitude of the Czechoslovak government to the Ukrainian state depended on the attitude of the Entente and the Paris Peace Conference and on the situation on the Russian-Ukrainian front. There were two competing tendencies in Czechoslovak political circles—a conservative, pro-Russian tendency, represented by K. Kramář, J. Stříbný, J. Dürich, and others, and a pro-Ukrainian tendency, represented by Tomáš Garrigue Masaryk’s group, which at first included Edvard Beneš, Jaromir Nečas, P. Macha, A. Němec, and others. The latter tendency was particularly evident in the government's attitude to the Western Ukrainian National Republic (ZUNR) and in its refusal to recognize Polish claims to Galicia. The Czechoslovak government maintained friendly relations with the ZUNR government and signed a trade treaty with it, providing for the importing of oil from the Boryslav fields to Czechoslovakia and the export of manufactured goods and arms to Ukraine. Czechoslovak missions were stationed in Stanyslaviv and Sambir. Czechoslovakia supported by diplomatic means the demand for eastern Galicia’s national self-determination. Prague’s interest in Ukraine and Russia was based not only on Czechoslovakia’s traditional Slavophilism, but also on economic interest, in particular on prospects for trade and capital investment in the East. For security reasons Czechoslovakia was interested first in a common border with Ukraine or Russia and then in forming a bloc of countries to counterbalance Austria and Hungary. Thus arose the concept of the Little Entente, to which Transcarpathia’s incorporation in Czechoslovakia was essential as a bridge between Czechoslovakia and Romania. In spite of their pro-Western policy and hostility towards the Soviet regime, the leaders of Czechoslovakia tried to normalize relations with the USSR and in 1935 signed a non-aggression and mutual-assistance pact with Moscow. Relations with the USSR did not prevent the Czechs from treating Ukrainian émigrés generously. Ukrainians found in Czechoslovakia the most liberal conditions and the fullest opportunities for their activities. In the interwar period the main centers of Ukrainian émigré cultural, academic, and political life developed there (see Prague and Bohemia). The first Czechoslovak Republic (1919–38) was a multinational state with all the attendant minority problems. Besides Czechs and Slovaks the country included Germans (23 percent of the population), Hungarians (5.6 percent), Poles (0.6 percent), and Transcarpathian Ukrainians (3.8 percent). The Transcarpathian Ukrainians joined the republic as a result of an agreement between Tomáš Garrigue Masaryk and the representatives of Transcarpathian immigrants in the United States and of a decision of the Central Ruthenian People's Council in Uzhhorod on 9 May 1919. This step received international sanction in the Treaty of Saint-Germain of 10 September 1919, which guaranteed Transcarpathia the status of an autonomous region within the Czechoslovak Republic. (For Czechoslovak policies in this region see Transcarpathia.) Prague had many problems with its minorities, particularly with the Germans and Hungarians, for whom Germany and Hungary demanded concessions. The Slovaks too were unhappy about their lack of territorial and political autonomy. In the fall of 1938 Adolf Hitler, with Hungary’s and Poland’s support, created an international crisis over Czechoslovakia. The Munich Agreement of 30 September 1938 handed the German Reich those districts of Bohemia and Moravia that were settled by Germans. Under Polish pressure the Czechoslovak government ceded Těšin (Cieszyn). Finally, the Vienna Award of 2 November 1938 transferred the southern regions of Slovakia and Carpatho-Ukraine, which were predominantly Hungarian, to Hungary. The second republic, headed by President E. Hácha, lasted to the middle of March 1939 as a quasifederative state in which Slovakia and Carpatho-Ukraine (by the law of 22 November 1938) enjoyed a wide autonomy. On 15 March 1939 Bohemia and Moravia were occupied by the Germans and became a ‘protectorate,’ while Slovakia and Carpatho-Ukraine declared their independence. The latter was quickly occupied by the Hungarians. In 1940 a Czechoslovak government in exile, headed by Edvard Beneš, was formed in London. It soon received recognition from the Allied countries. In this government the interests of Transcarpathia’s Ukrainians were represented by P. Tsibere and I. Petrushchak. In 1943 General L. Svoboda organized the Czechoslovak Brigade in the USSR to fight the Germans. Many Transcarpathians belonged to this brigade. In 1944–5 the territory of Czechoslovakia was liberated from the Germans and Hungarians by the Soviet Army and partly by the Western Allies. Slovak independence came to an end. The third Czechoslovak republic was established. From November 1944 to February 1945 a delegation of the Czechoslovak government chaired by the minister F. Němec resided in Khust and provisionally administered the five eastern districts of Transcarpathia. The local Communist administration of the People's Council of Transcarpathian Ukraine, which was set up under the aegis of Soviet Army authorities, interfered with the delegation's functioning. Finally, Czechoslovakia ceded former Subcarpathian Ruthenia to the USSR in a treaty signed on 29 June 1945, and the territory was annexed to the Ukrainian SSR. In February 1948 the Communist party staged a coup d'état with Soviet aid, and Czechoslovakia became a ‘people’s democracy’ with a one-party regime and an integral part of the Soviet bloc. 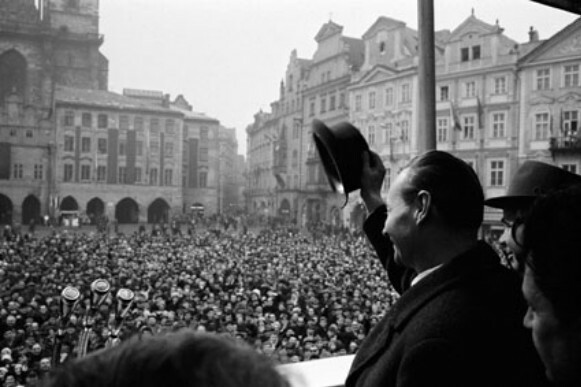 In 1967–8 the regime began to be reformed and democratized under A. Dubček. The country was restructured into a federation of Czechs and Slovaks. Ukrainian representatives sat on both legislative bodies and in the Slovak National Assembly. In August 1968 the armed forces of the USSR and other Warsaw Pact nations invaded Czechoslovakia and put an end to the experiment of ‘democratic socialism.’ Fearing the influence of the ‘Prague spring’ in Ukraine, the leading Soviet Ukrainian members of the Politburo and the government, such as Mykola Pidhirny, Petro Shelest, Volodymyr Shcherbytsky, and the Soviet ambassador to Czechoslovakia, Stepan Chervonenko, played a key role in the Kremlin's decision on military intervention. Czechoslovakia was under Soviet occupation, but the passive resistance of the people and particularly the intellectuals continued. Pro-Soviet and Stalinist elements remained in power in Prague and Bratislava. Among them, a prominent role was played by Vasyl Bilak, a member of the Politburo of the Communist Party of Czechoslovakia, who was of Ukrainian descent. The party's secretary general was the Slovak G. Husak, who became president of the republic in 1975, replacing L. Svoboda. In the 1970s Czechoslovakia became one of the most-integrated and closely controlled states of the Soviet bloc. It was the Velvet Revolution of 1989 that brought profound political, social, and economic changes to Czechoslovakia and eventually led to the peaceful split of the country into the Czech Republic and Slovakia on 1 January 1993. Economic relations. Economic relations between Soviet Ukraine and Czechoslovakia were determined by their proximity, their membership in the Comecon, and the structure and resources of their economies, which to a large extent were complementary. In 1966 Czechoslovakia was the second-largest importer of Ukrainian goods. Ukrainian-Czechoslovak trade in 1967 exceeded 550 million rubles. Ukraine exported to Czechoslovakia iron ore (3,657,000 t or 72 percent of Czechoslovakia’s imports in 1958, 6,953,000 t or 75 percent in 1964), manganese (34 percent), pig iron (72 percent), and rolled steel (75 percent). Ukraine also provided Czechoslovakia with food products—grain, meat, butter, and salt. In 1967 the Brotherhood pipeline, which delivered natural gas from Dashava in Western Ukraine to Czechoslovakia, was opened. Ukraine supplied Czechoslovakia with electricity through the Peace transmission line. Soviet Ukraine took part in equipping the huge east Slovak metallurgical complex in Košice. Czechoslovakia on its part helped Ukraine to modernize its mines and transport systems. Czechoslovak machinery was used to a large extent in the conversion to electric trains. A wide-gauge railway line was built between Chop and Košice to improve the transportation of goods from Ukraine. Ukraine imported precision machine instruments, refrigerators, cables, chemical and pharmaceutical products, furniture, and some food products from Czechoslovakia. Economic relations and co-operation between Ukraine and Czechoslovakia were conducted according to general Soviet economic policy and were directed by Union agencies, often without consideration for Ukraine’s economic interest. Cultural relations between the two countries were to some extent dependent on republican agencies (a branch of the Czechoslovak-Soviet Friendship Society) and on interoblast and interinstitutional efforts at co-operation (eg, between Kyiv University and Bratislava University). Sometimes ‘days of Ukrainian culture’ were staged in Czechoslovakia and ‘days of Czechoslovak culture’ in Ukraine. There was a consulate general of the Czechoslovak Socialist Republic in Kyiv, but Soviet Ukraine had no representation in Czechoslovakia. A referral to this page is found in 180 entries.